Patriotic Alphabet by Oopsy daisy - This unique boys' ABC wall art was created by Oopsy daisy artist Megan & Mendy Winborg. Each Patriotic Alphabet canvas is printed on museum quality canvas using the Giclee printing process. Your canvas will be virtually indistinguishable from the original created by Megan & Mendy Winborg. As an added bonus, when you purchase this boys' ABC wall art, Oopsy daisy will donate a portion of the proceeds to children's charities. Made in the USA. Full Description Patriotic Alphabet by Oopsy daisy - This unique boys' ABC wall art was created by Oopsy daisy artist Megan & Mendy Winborg. 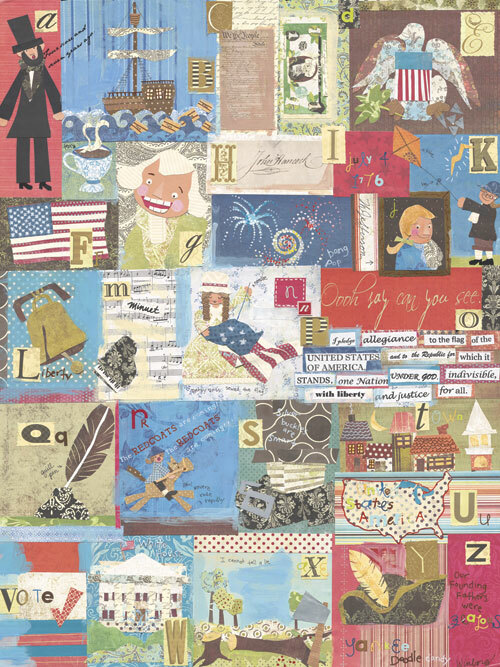 Each Patriotic Alphabet canvas is printed on museum quality canvas using the Giclee printing process. Your canvas will be virtually indistinguishable from the original created by Megan & Mendy Winborg. As an added bonus, when you purchase this boys' ABC wall art, Oopsy daisy will donate a portion of the proceeds to children's charities. Made in the USA.